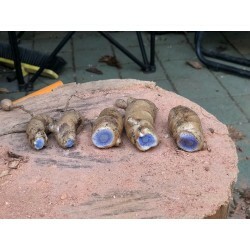 Curcuma caesia or black turmeric is a perennial bluish-black rhizome. It is more used for its medicinal properties (more details in the description below) than for cooking because of its very bitter taste. 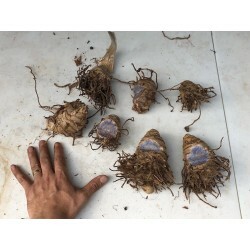 Grow your own black turmeric from this root. 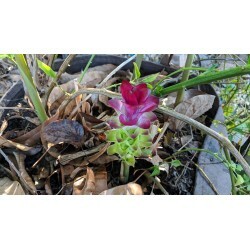 It is a rare plant here in Australia and you will probably not find it easily. These are bulbs (as seen on the first photo) from which I've already cut off the sprouting bit for planting. What's left can be used for consumption (medicine). We select sprouting rhizomes before shipping them to you. To plant them make sure to follow the following recommendations. Well draining potting mix is important, especially if you keep your rhizome in the container over the winter period to continue grow them on the next season. Failure to do so might lead to root rot due to excess moisture. The potting mix needs to be light, loamy and rich in organic matter. If planting directly in the ground, dig a hole of about 30cm diameter and 30cm depth and fill it with your potting mix. 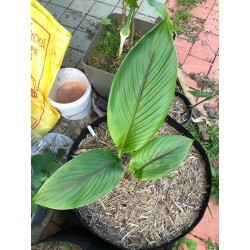 Mulch generously to prevent evaporation of the potting mix during hot seasons.